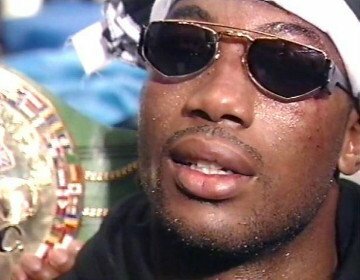 Happy Birthday, Lennox Lewis – The greatest heavyweight champ after Ali? “Not in this lifetime,” heavyweight legend George Foreman on the subject of him fighting Lennox Lewis. Retired heavyweight legend Lennox Lewis turns 52 today. The last undisputed world heavyweight king holds another fine distinction: that of being a fighter who defeated every opponent he ever faced. Yes, Lewis suffered defeat – by stoppage, at the hands of Oliver McCall in 1994 and to Hasim Rahman in 2001 – but he did what the greats fighters do: come back and get revenge. Lewis achieved so much during his two careers; amateur and pro. Boxing at two Olympics, in 1984 and in 1988, Lewis captured gold in Seoul in ’88. As a pro, the London-born Lennox, who relocated to Canada when just 12 years old, won absolutely everything he could have won: the British, European and Commonwealth titles and then, after reigning as the WBC heavyweight champ, the undisputed titles. Retiring with a fine 41-2-1(32) record in 2003, Lewis waked away on his own terms; safe in the knowledge that he had achieved all his goals. Lewis showed great boxing ability: see his wins over David Tua and Evander Holyfield. He showed a great chin: see his war with Ray Mercer. And Lennox showed brutal punching power: see his crushing KO’s over Hasim Rahman, Frans Botha, Donovan “Razor” Ruddock and Frank Bruno. Indeed, the only knock on Lewis today, from certain fans, is the fact that he never gave Vitali Klitschko a second shot at his title. Lewis went to war with Klitschko in his final fight, when overweight and past his very best (and when he had trained to face an entirely different opponent) and he barely escaped with a win. Exhausted, or sure looking like it, Lewis saw the damage he had inflicted on Klitschko’s face get him the out-of-jail win. Would Lewis have beaten Klitschko in a rematch? This question is the only one that in any way haunts Lennox’ C.V (again, in the opinion of some fans). But Lewis, throughout his 14-year pro career, showed his greatness. To the extent that today, fans ask what would have happened had a prime Lewis been matched with the likes of Ali, Foreman, a peak Tyson and all the other heavyweight greats. Foreman has always had a high opinion of the man he perhaps could have fought in the mid-1990s but didn’t really want to, and “Big” George is not alone in rating Lewis so highly. An all-time great? Lewis is certainly that. You are here: Home / Boxing History / Happy Birthday, Lennox Lewis – The greatest heavyweight champ after Ali?